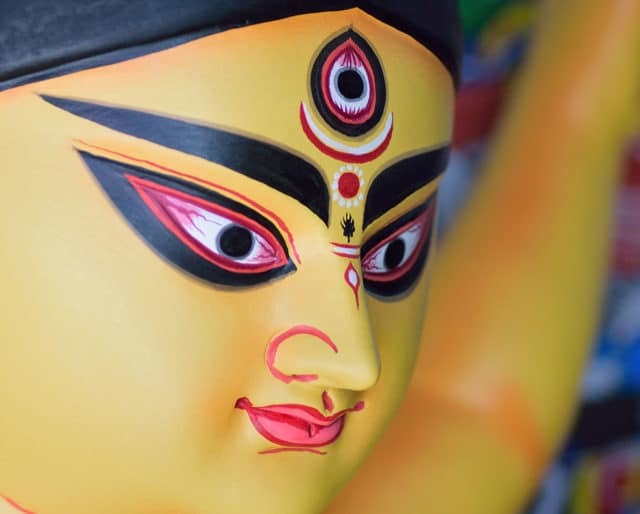 Durga Puja is celebrated in the Hindu calendar month of Ashvin, which falls in September or October. This is a 10-day festival which, this year, starts on October 4. The first nine days are called “Navratri.” People offer prayers (puja) to Goddess Durga for slaying the buffalo demon Mahishasur. The festival ends on the 10th day. The victory of King Rama, an avatar of Vishnu, who vanquished the 10-headed demon Ravana, is also celebrated. Ravana’s effigy is burned and prayers offered. Durga Puja symbolizes the victory of good over evil. ​In the city of Guwahati in India, a 100-foot tall idol of Durga was displayed as part of the Durga Puja celebrations! A dozen friends from Bengal teamed up and collected contributions to conduct the first community puja. They started a trend that is still popular in India today. According to some historians, Bhabananda Mazumdar of Nadiya or Raja Kangshanarayan of Taherpur organized the first Durga Puja. ​Many historians claim an earlier date for the first celebration; landlords of Dinajpur and Malda were probably the first to celebrate this festival. Watch the drama of "Ram of Leela"
The dramatic folk re-enactment of the life of King Rama and the slaying of Ravana is a must-see at any Durga Puja event. Huge canopies are erected to present the tableau of Durga — and after offering prayers one can enjoy food and shopping at these pandals. Most children love to hear the story of the slaying of Mahishasur and Ravana. The epic "Ramayana" is also a great read for both adults and children. ​It's believed that Goddess Durga comes from heaven to her parent's house on Earth every year during Durga Puja. And so the Hindus, her family, entertain and pamper her by offering her foods, gifts, and prayers. While in most places, the effigies of Ravana are burned on Vijaydashmi, in a few places like Jodhpur and Mandya, Ravana is worshipped for his devotion to Lord Shiva. ​During Durga Puja, in the city of Kolkata, Bengal, over 45,000 pandals are erected to host community Durga Pujas. Each pandal is more creative than the other! ​Durga is often depicted as having 10 hands and this is symbolic of her various "shaktis" (powers). In each hand she holds a weapon or an object that depicts a certain virtue. Ravana's 10 heads represent his knowledge of the six "Shastras" and the four "Vedas." But some say they stand for the 10 bad qualities that plague human character. They are burned in his effigy on "Vijaydashmi" as good wins over evil! And in doing so it restores our faith in all that is good and just. Some people fast for nine days, others feast on special dishes that are cooked during this festival. Everyone is free to celebrate in their own way. Dandiya dances, music concerts, food fairs, and religious dramas; these are all a part of Durga Puja — making it a fortnight full of fun events.